Ideal for setting nails into materials; long length for setting nails in hard-to-reach areas; fully hardened, precision-milled steel for long life; long, beveled tip for easy nail head alignment; square head prevents rolling when set down. Made of fully hardened, precision-milled steel with long, beveled tip for easy nail head alignment, grip is slip-resistant and ribbed to absorb shock, improving precision. Long length enables user to set nails in hard-to-reach areas. Made of fully hardened, precision-milled steel with long, beveled tip for easy nail head alignment, grip is slip-resistant and ribbed to absorb shock, improving precision. Long length enables user to set nails in hard-to-reach areas. Made of fully hardened, precision-milled steel with long, beveled tip for easy nail head alignment, grip is slip-resistant and ribbed to absorb shock, improving precision. Long length enables user to set nails in hard-to-reach areas. Made of drop forged heat treated alloy steel with a knurled body for sure grip. Used to sink finishing nail or brad below the work surface. Set contains (1) each: 1/32", 1/16", 3/32" and 1/8". Ideal for rapid setting of nails and brads. Designed to reduce marring of wood surface. Sets 4D and 6D finishing nails. Nickel-plated for durability. Made of hardened and tempered alloy steel with square head, round knurled body; tips are cupped and chamfered. Square head prevents rolling; 4" inches long. Set contains (1) each: 1/32", 1/16", and 3/32". 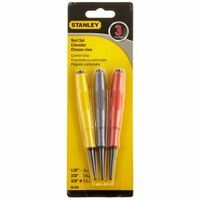 Stanley Nail Set, Cushion Grip, 3 Pieces, Includes: 58-911 Model 1/32 in Nail Setter, 58-912 Model 2/32 in Nail Setter and 58-913 Model 3/32 in Nail Setter, Steel, Assorted Interchangeable tip for convenience; hexagonal head prevents rolling and can be used as a standard drill chuck ? nail set doubles as drill extension; knurled locking collar for easy nail release and reversal; accepts standard screwdriver bits for versatility; long, beveled tip for easy nail head alignment; fully hardened, precision-milled steel for long life. Set includes: (1) each: 1/32?, 2/32?, 3/32? and #2 point Phillips. The Spring Tools 1/32 in. to 2/32 in. combo nail set is designed to effortlessly set nails and pneumatic brads to a desired depth. These professional grade tools are ideal for the painter or cabinet maker who occasionally needs to set nails and are outstanding for tight work spaces. The set is easy and safe to use and it's also extremely durable. Made in the USA. Includes a combination 1/32 in. nail set (sku # 734.1787) and 2/32 in. door pin removal tool. Provides 3,500 pounds of impact striking force. Great for tight spaces. Patented design is safe and easy to use. Made in the USA.